A “strong magnitude 7.1 earthquake” struck the southern coast of Peru on Sunday morning, leaving at least one dead, several missing, and dozens injured, CNBC reported. 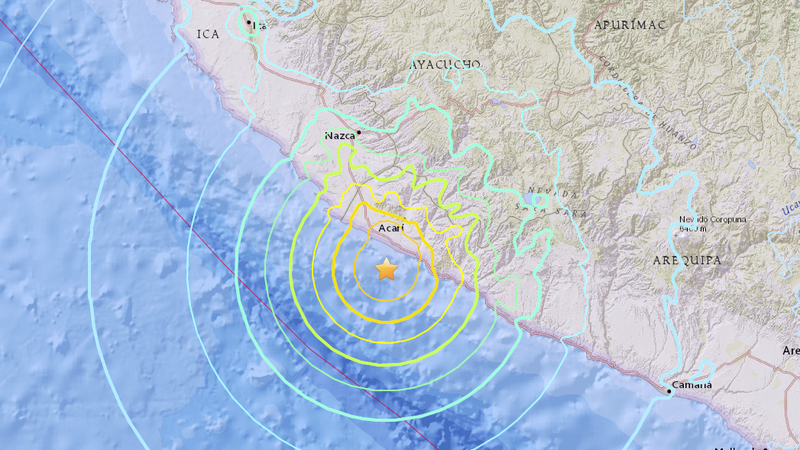 According to the U.S. Geological Survey, the quake struck roughly 22.4 miles (36 kilometers) offshore centered about 25 miles (40 km) into the Pacific Ocean from the town of Acari. CNBC reported that local officials said one man was killed by a rock in Yauca. Beyond that, there were some indications that the damage may not be as grim as originally reported. Per the BBC, Health Minister Abel Salinas disputed reports that 17 miners had gone missing inside a collapsed shaft. Reports of another death in Bella Union were also disputed by local officials. Per CNN, the National Civil Defense Institute reported at least 65 additional injuries “in the cities of Arequipa, Ica and Ayacucho.” The casualty count is likely to rise as emergency personnel continue to look through rubble. Though the U.S. Pacific Tsunami Warning Center warned that a wall of water could come crashing onto the shoreline, fortunately no such tsunami actually occurred and the center later advised that the threat had passed. Earthquakes of magnitude 7 and higher are considered major events with the possibility of serious damage or casualties; only an estimated 20 or so occur each year. A magnitude 8.0 quake in 2007 off the central coast of Peru was estimated to have killed well over 500 people and destroyed tens of thousands of buildings. Peru is located on the “Ring of Fire,” the belt of earthquakes and volcanoes surrounding the Pacific Ocean. All along its western coast, the South American plate is colliding with the Nazca plate, forcing the heavier ocean crust down into the Earth’s mantle. The collision of the plates is like a slow-motion car wreck. They’re colliding at only 3 inches per year, but that’s enough to cause frequent earthquakes—and build the Andes Mountains. The tectonically active region along the coast of South America, known to geologists as the South American arc, is more than 4,000 miles long, from just below the southern tip of Chile to just off the coast of Panama. Despite the high risk throughout Peru, though, the situation with regards to preparation for seismic events (particularly in construction and building standards) is not so good. A 2012 review found the capital city of Lima, with a population of over nine million, could suffer tens of thousands dead and hundreds of thousands injured if an 8.0 magnitude earthquake hits there.